For couples looking for unique diamond cuts for their jewelry, an Asscher cut can add personality and individuality to their style. The elegant Asscher cut engagement ring design is rapidly gaining popularity as a sophisticated alternative to more traditional choices. The Asscher cut diamond was first created in 1902 by the Asscher brothers of Amsterdam, Holland - renowned lapidaries responsible for cutting a number of exquisite gems, including the famous 3,015 carat Cullinan Diamond, which is now part of the British crown jewels. The Asscher stone's distinctive shape - square with deeply trimmed corners resembling an octagon - is sometimes called the square emerald cut, and is also a type of modified cushion cut. An Asscher stone is cut with a series of many parallel steps, creating a hall-of-mirrors effect when looking deeply into the stone. These steps create more internal refraction and diamond fire than typical step cut stones, such as the elongated emerald cut or the radiant, which has only slightly trimmed corners. Because this diamond cut has been exclusively patented, every genuine Asscher diamond has the Asscher family insignia and a unique identification number emblazoned directly on the stone's girdle. These marks are only visible under high magnification, but a jeweler should be able to show them to prospective buyers to verify the diamond's authenticity. Vintage Asscher diamonds are popular in art deco engagement rings. The style was popular in the 1920s, but the production facility closed in 1930 owing to difficult times during the worldwide Great Depression. They reopened in 1945 and continued designing Asscher cut rings and other elegant jewelry. In 2001, the Asscher diamond was redesigned and repatented to make it more difficult for counterfeit cuts to be distributed. Modern stones have slightly smaller corners and a larger central table (the flat top of a cut diamond). Sixteen additional facets were added to increase the cut's sparkle, and modern Asschers have a total of 74 facets per finished stone. A deep cutlet at the base of both vintage and modern Asschers accentuates the depth of the stone by drawing the eye into the gem with startling clarity. Vintage and antique engagement rings can be found with older Asscher diamonds featuring the heavily beveled corners. Because of advances in lapidary technology, older rings may not have the same cutting precision of modern pieces, and modern rings tend to sparkle more because of the additional facets. Couples interested in acquiring a vintage Asscher should peruse estate sales and antique shops for suitable pieces. Because step cuts allow more depth of the diamond to be seen, precise cutting is extremely vital for a quality Asscher diamond. As with emerald cuts, flaws and inclusions can be easily seen and it is important to choose a quality stone. Furthermore, color is an important consideration because it may be more visible at the stone's wide corners. Blue Nile, which distributes a large selection of Asscher cuts ranging from one-third to more than three carats, recommends that the length-to-width ratio of the cut falls between 1.00 and 1.05 and stones should have exceptional color and clarity for the best effect. For all the steps to be properly incorporated, Asscher cut diamonds are typically deeper than more common cuts. 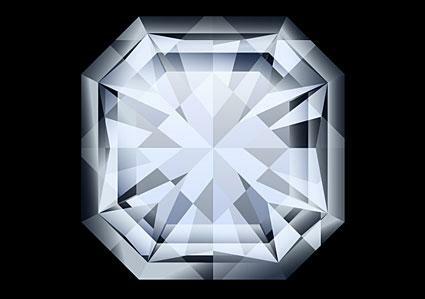 Because such high quality is necessary, however, many Asscher diamonds tend to be smaller than easier cuts. For couples interested in a large diamond for their engagement ring, an Asscher cut is not the most economical choice. On the other hand, the uniqueness and intricacy of the cut can outweigh the stone's size by providing a truly exceptional look, even with a smaller stone. All true Asscher stones are certified either through the Gemological Institute of America or the High Council for Diamonds in Antwerp, Belgium. Jewelers offering stones without this certification are likely offering lower quality imitation cuts and savvy consumers will avoid such transactions. Asscher diamond in a pave setting. The most common setting for an Asscher cut engagement ring is a four-prong arrangement. Step cut diamonds do not naturally reflect as much light, and the prong setting allows the stone to be elevated and attract more light than it would in a channel or bezel setting. The prongs should not be wide enough to obscure the stone's distinctive corners, however. A popular setting is the pave setting, which coats the ring with a brilliant crust of diamonds that complements the rarity and beauty of the style. Many rings use accent stones, particularly trilliant, princess or emerald cuts that can nestle securely against the flat sides of the center stone. Because of the unusual cut, however, a single elegant Asscher diamond can create a stunning engagement ring without additional embellishments. King of Jewelery has multiple Asscher cut diamond rings in a variety of settings. Blue Nile also allows you to design your own ring. Select the Asscher cut, clarity, carats, color and setting to build your ring. Diamonds by Lauren carries Asscher cut diamonds that they use to create unique and colorful engagement rings. Reese Witherspoon's 4 carat engagement ring is an Asscher stone. Kate Hudson's 5 carat art deco ring was an Asscher cut. Julia Roberts wore 10 carats of Asscher stones in stunning earrings to the 2003 Academy Awards. With deeply angled corners and remarkable depth, Asscher cut rings make stunningly beautiful engagement ring alternatives to more traditional emerald or princess cut rings. From vintage rings to modern stones, an Asscher diamond makes a sophisticated statement about the bride's individuality and personality, and the timeless cut is sure to remain an elegant gem for many years.